Chipmaker says 5G-ready smartphones could launch mid-2019. Qualcomm has taken a major step towards 5G smartphones with the first successful test of the next-generation networks on a mobile device. The US chipmaker confirmed it completed 5G connections trials at its San Diego headquarters, and that devices with 5G compatibility could be released as soon as mid-2019, ready for the expected worldwide launch of 5G networks in 2020. Qualcomm says that it carried out the tests on its X50 5G modem, which was released last year, with the test taking place on the 28GHz millimetre wave frequency band. The company says it achieved download speeds of up to 1GBps using the network, but forsees speeds of up to 5GBps when 5G networks have been fully deployed. 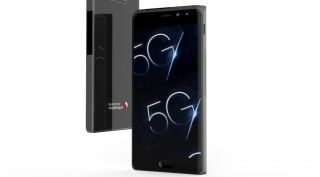 “Achieving the world’s first announced 5G data connection with the Snapdragon X50 5G modem chipset on 28GHz mmWave spectrum is truly a testament to Qualcomm Technologies’ leadership in 5G and extensive expertise in mobile connectivity,” said Cristiano Amon, executive vice president of company subsidiary Qualcomm Technologies, which carried out the tests. Alongside the tests, Qualcomm showed off its plans for what 5G-ready smartphones should look like, with a new reference design that aims to contain the power of 5G within a smartphone form factor. This new design, which will be tested by the company in its ongoing 5G research, will allow smartphone makers to build super-slim devices with edge-to-edge displays, even for mid-range smartphones.